US President Donald Trump has arrived in China for a visit likely to focus heavily on trade and tensions with North Korea. He has landed in Beijing where Chinese counterpart Xi Jinping has a lavish reception planned for him. What’s in store on Trump’s trip? Before his arrival, Mr Trump piled praise on Mr Xi, saying he was looking forward to meeting the Chinese president after “his great political victory”. Despite his congratulations, there are tensions between the two men, with Mr Trump having attacked China over its allegedly unfair trade practices. The US president and his wife Melania are scheduled to visit the Forbidden City, for centuries the home of China’s emperors, followed by afternoon tea. What did Trump say about North Korea? His arrival came just hours after his speech in the South Korean capital Seoul, in which he described North Korea as “a hell that no person deserves”. But there were hints though he might be open to a deal, telling the North “we will offer you a path for a better future”. 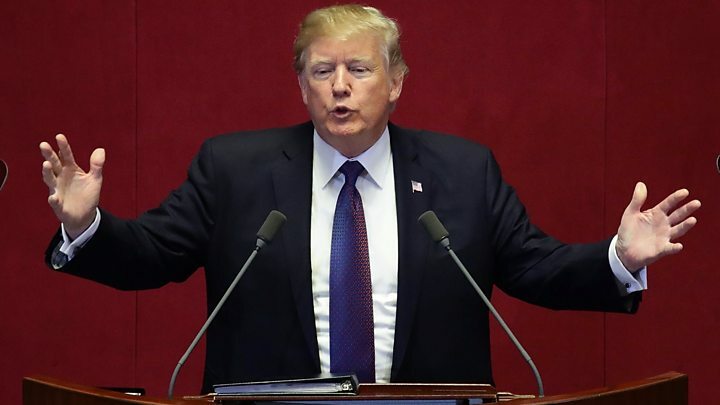 Singling out Russia and China, he urged “all responsible nations” to isolate the North, and fully implement UN sanctions, downgrade diplomatic ties and sever trade and technology ties. China is North Korea’s only major ally, but says it is committed to the UN sanctions and argues its leverage is overestimated.